Edelkrone has established themselves as making high quality, unique camera rigs for any kind of camera you may have. But camera rigs are not the only unique products they design. I’m always in the market for a good follow focus. I’ve gone through over a dozen different models in the past, each having their own benefit and disadvantage. With a flood of new, super cheap follow focus designs on ebay, how unique could a follow focus be? Turns out, quite a bit. The Focus One Pro works as well as a follow focus should: you turn the focus handle and it rotates the focus barrel of your lens. Pretty simple. But where it separates itself from other models is in its marking disk design and adjustability. Having the marking disk facing the camera op makes pulling focus much more optimized for a single shooter. Having a single rail design makes it easy to swing away from the lens for quick swaps, but could be an issue if they didn’t make the handle easily rotatable. And a second gear is standing by and can easily be brought in for lenses who’s focus barrel rotates reversed and will correct the focus rotation for the operator. Build quality is very solid. All the main components are metal and feel very reliable. As far as price, with so many pro follow focus systems over $1,000 and “cheap” being around $500 for a traditional follow focus, it’s great to see this model come in for under $300. One would think its hard to get excited about something that is just an arm that holds your monitor, but if you’ve fidgeted with articulating arms for the past several years like myself, seeing an improvement on the format is very welcome. 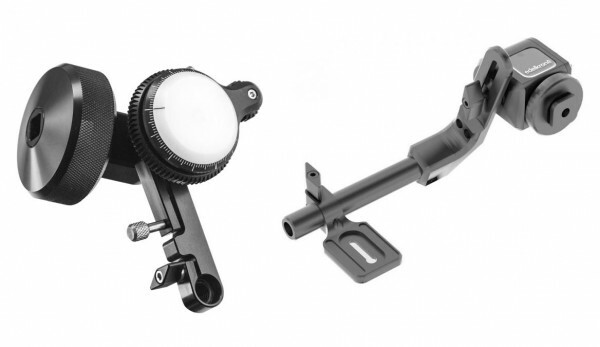 The EVF & Monitor Holder from Edelkrone really makes your monitor an extension from your camera. It uses a tension based system that allows the monitor to stay solid in position but also can easily be adjusted with just one hand. Attaching the monitor to the holder is really easy as the rod attachment can be slid off, screwed onto the monitor and slid back on. Build quality is just like the follow focus, metal and solid. I’ve used this with my SmallHD DP6 and DP4 EVF and it handled the weight just fine. Pricing is on par with a professional articulating arm even though it works so much better.